Don't ever merge or split cells, as the cell properties you set for one cell could affect another cell somewhere that you don't intend and there's no way to unlink their properties if Dreamweaver thinks they're related. Please note: For those of you doing both GUI (10885) and Web Development for Multimedia (10886), this project is assessed for different Learning Outcomes in each unit, but the intention is that you can integrate both assessments in the one project to enable you to spend more time and effort getting the project right. 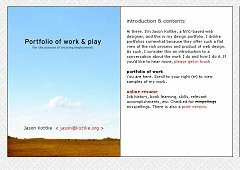 Investigate a range of personal/professional portfolio sites, analyse what you would want on a personal portfolio site of your own. You should base the design on common user expectations from other websites. You then need to design the layout (using either a graphics package or drawing by hand) and create the graphical elements required for this layout in a web-appropriate format (gif or jpeg). While some Flash is allowed as content, in this instance in cannot be used for navigational or other core functional elements. Building a website is a technical and often difficult process, so it’s essential that all of your planning and design work is well organised so that if you intended to continue on and actually build the site, you’d be able to do so from your project plan. Your project plan for this project should include as a minimum: a project overview, visual concepts, site structure chart, and a storyboard. You should also collect all of your content in an appropriate size and format (if you’re also doing the unit Web Development, include sufficient content to meet the requirements of that unit’s Assessment 3 and integrate your efforts) – as this will affect your layout. All graphical user interface elements required to construct the site using an Authoring package (such as Dreamweaver) . These must be in a web-appropriate format. Students will build either a personal website or weblog using authoring software. You can integrate material developed in the two earlier assignments. Building a website is a technical and often difficult process, so it’s essential that all of your planning and design work is completed prior to starting construction. Your project plan for this project should include as a minimum: a project overview, visual concepts, site structure chart, and a storyboard. The site must include at least eight pages (website) or entries (weblog), a suitable home page and consistent navigation system. It must also embed at least one of each of the following Multimedia elements: audio, video and interactive or Flash-based animation. These can either be your own work, for example created here at TAFE, or you can use showcased material harvested from elsewhere, subject to copyright. Images and other files should be appropriately formatted for the web. Must link to a downloadable pdf of your resume for printing. Preferably viewable at both 800x600 and 1024x768 screen resolution (can be fixed width with a background to fill out sides at higher resolutions, or variable width). If you choose to make a larger site that will not fit @ 800x600, you should be able to justify your decision. Can be a spliced-graphic layout as long as it includes some text-based content as well to ensure some ranking, ability to update easily etc. Should contain links to download any Plug-Ins that are required by your content (eg latest Flash player, Quicktime etc). kottke.org - portfolio A very nice, clean portfolio. He's an icon of web usability and yet he deliberately breaks some of the standard rules in this site, such as scrolling right. I think in this case he makes it work well, though.